The following works present an especially interesting mix of personal equipment. Banks, Iain M. Consider Phlebas (Macmillian, 1987) and sequels. The utopian Culture is an example of a TL12^ society with the radical tech and emergent superscience paths. Bear, Greg. Queen of Angels (Warner Books, 1990). Bear's future LA is a good example of a TL10 radical hard SF society. The sequel Slant has some particularly nasty nanotech. Brin, David. Startide Rising (Bantam, 1983). A good example of a TL12^ setting (although Terran humanity is mostly TL9^). Blish, James. Cities in Flight (Overlook, 2005). Besides the wonderful notion of all of Earth's cities migrating into space using contragravity generators, this omnibus of four novels published in the 1950s describes dozens of fascinating science fiction gadgets and weapons. Brimmicombe-Wood, Lee. Aliens Colonial Marines Technical Manual (Boxtree, 1995). A super-detailed hard SF extrapolation of the world envisioned in the movie Aliens, focusing on military equipment and vehicles. Cole, Alan, and Bunch, Chris. Sten (Del Rey, 1982). This book and its sequels follow the adventures of a special ops team with many nifty weapons and gadgets. Dickson, Gordon R. Tactics of Mistake (DAW, 1971). The Dorsai series helped establish the military SF genre; its weapons tech strongly influenced many SF games. Di Filippo, Paul. Ribofunk (Four Walls Eight Windows, 1996). Filippi's world is a definitive example of a TL9/11 high-biotech society. Egan, Greg. Diaspora (Millennium, 1997). A good example of a TL11 radical hard SF society. Gibson, William. Neuromancer (Ace, 1984). A classic example of a cyberpunk-technology world; it and its sequels are filled with interesting brand-name gadgetry. Hamilton, Peter. The Reality Dysfunction Part I: Emergence (Macmillian, 1996). A blend of post-cyberpunk and space opera epic, with plenty of well-described gear. Harrison, Harry. The Stainless Steel Rat (Doubleday, 1961). Super-agent Slippery Jim DeGriz makes use of many creative ultra-tech gadgets in his adventures. This series is also the origin of much popular SF gaming nomenclature, such as "gauss rifle." Heinlein, Robert. Starship Troopers (Putnam, 1959). 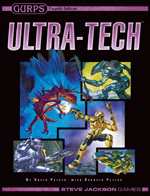 The definitive novel for military battlesuits. Herbert, Frank. Dune (Chilton Books, 1965). A good example of a TL7 retro-tech society with emergent superscience existing in the shadows of high-biotech and psi-tech cultures. Langford, David. The Space Eater (Arrow Books, 1982). An exposition of all the nasty things you can do with regeneration tanks and telegates. Miller, Marc W. Traveller (GDW, 1977). Just about every SF roleplaying game has spawned a book or two of weapons and gadgets, but Traveller's many incarnations are unsurpassed in their depiction of a detailed TL10-11^ safe-tech setting. Morgan, Richard. Broken Angels (Gollancz, 2003). Up-to-date space opera focusing on the kind of special-ops mission adventurers seem to get involved in; plenty of ultra-tech military, medical, and spy gear is described. Niven, Larry. Ringworld (Ballantine, 1970). The keystone of the Known Space series, filled with exotic superscience technology from matter-transport booths to stasis fields. Niven is especially good at depicting how these devices affect society. Piper, H. Beam. Space Viking (Ace, 1963). One of the key works in an excellent safe-tech space opera series that inspired many SFRPGs. Also a good source for advanced nuclear weapons and contragravity-using societies. Smith, Edward E. Gray Lensman (Fantasy Press, 1951). Doc Smith's Lensman series remains the ultimate superscience (and psi-tech!) galactic space opera, and this volume is packed with manic adventure and ultra-tech gadgetry. Stephenson, Neal. The Diamond Age (Bantam, 1985). Contains many imaginative descriptions of the use and abuses of nanotech. Stross, Charles. Singularity Sky (Ace, 2003). Stross shows what happens when a TL10 safe-tech society tries to fight one with advanced nanotech. Its sequel, Iron Sunrise, also has much to offer, including not one but two system-smashing doomsday weapons. Vinge, Vernor. A Fire Upon the Deep (Tor, 1992). Espouses the concept that tech levels (or at least, areas where superscience works) might be part of the galaxy's structure, as well as an amusing galactic communications network that works just like early-1990s Usenet. Westerfeld, Scott. The Risen Empire (Tor, 2003). A lively example of the "new space opera" school that blends cutting edge nanotech with plenty of superscience. Much of the book is devoted to ultra-tech commando actions described in painstaking detail. Williams, Walter Jon. Voice of the Whirlwind (Tor, 1987). An example of a TL9/11 cyberpunk society with emergent superscience, as well as a good depiction of ultra-tech special ops and espionage. The prequel Hardwired is a definitive cyberpunk novel, especially worthwhile for its nasty cyber-tech and neural-interfaced vehicular combat. Drexler, Eric, Peterson, Chris, and Pergamit, Gayle. Unbounding the Future: the Nanotechnology Revolution (William Morrow, 1991). The promises and pitfalls of advanced nanotechnology. Forward, Robert L. Indistinguishable from Magic (Baen, 1995). A scientist and science fiction writer imagines possible future technologies. Nichols, Peter. The Science in Science Fiction (Book Club Associates, 1982). A very thorough and well-written survey of SF technology (up to the early 80s), and how it works – or why it wouldn't. Star Trek: The Next Generation (Gene Roddenberry, 1987-1994). The Federation is a definitive example of TL12^ safe-tech society. The workings of its superscience technology has been laid out in unusual depth in many published technical manuals. Star Wars (George Lucas, 1977). The Empire is an example of a TL10-11^ setting where most of the wealth went to pay for giant megaprojects!